The quest to master salon-worthy blowouts at home on the regular can feel like a daunting task. Our typical morning hair routine begins with the best intentions but often ends in a ponytail after hitting snooze a few times. On better days, we’re fumbling with a bunch of styling tools and are lucky to nail a halfway-polished look before rushing out the door. But just as we were about to give up and succumb to an eternity of buns and topknots, our styling woes were solved with NuMe’s Stealth Hair Dryer. This sleek tool combines several cutting-edge technologies for smooth, shiny tresses in a lot less time. Curious to learn more? Find out exactly why you need to add this­­­ state-of-the-art dryer to your hair arsenal now. 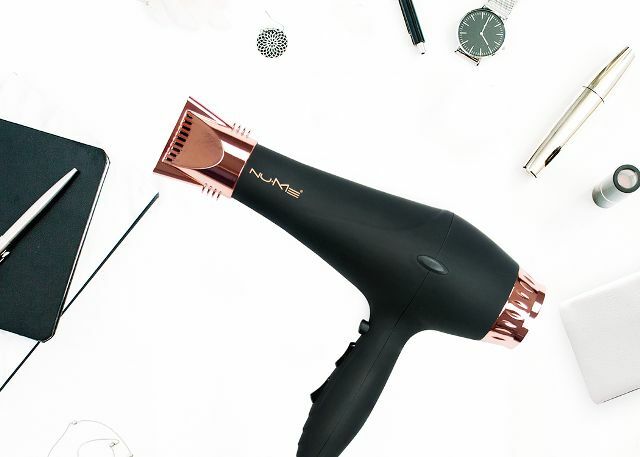 The NuMe Stealth Hair Dryer is a rose-gold stunner that boasts a brushless motor, so it’s lightweight and whisper-quiet while providing strong, even airflow to dry quickly and without damage. Equipped with negative-ion conditioning technology, it also seals the cuticle to nix frizz and flyaways, leaving you with super-smooth texture and ultra-glossy shine. But there’s more. The device even uses integrated far-infrared technology to actually beam light directly onto the hair for even faster results. Impressive technology aside, all we care about is having silky, lustrous locks at lightning speed. Sold. We’ll do whatever it takes for an easier morning routine, so the ability to score a pro-level blowout at home in less time is a real godsend. And the NuMe Stealth Hair Dryer even protects our tresses, so this gold-standard tool deserves a prominent spot on our vanities. Although the cost may be a bit more than your average dryer, consider that the brushless motor extends its lifetime—often five to 10 years compared to the standard one to two years—so the splurge is totally worth it. Shop the Stealth Hair Dryer online and more must-have products from NuMe here. Even better? Receive 30% off site-wide with code BYRDIE30 now through December 22.